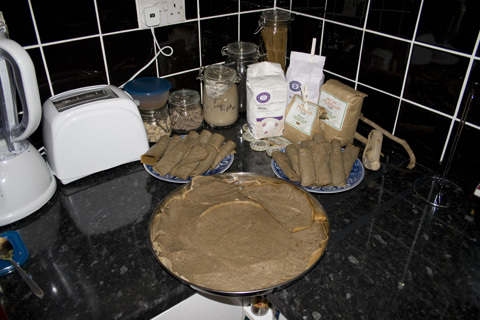 In my earlier post documenting some of the steps I took to make Ethiopian injera bread in the UK, I mentioned that it took close to a full month to get a vigorously healthy starter going. Also, I used cheaper flour that contained gluten in it for the beginning steps. The starter is overflowing the container slightly. 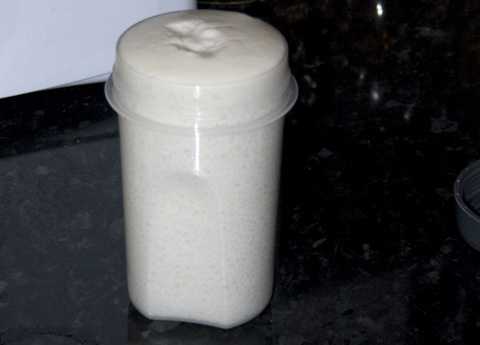 A closeup of the starter. 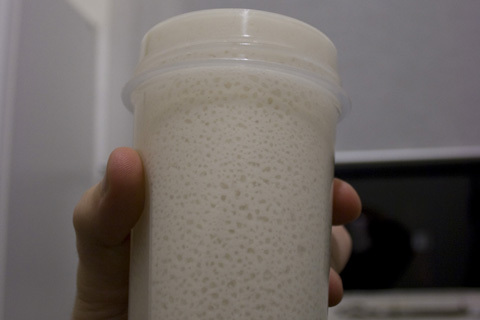 You can see the bubbles of the healthy starter. A day and a half ago, the container was only half full, but on it’s own, the active yeast cultures caused it to rise all on it’s own. I’m not sure if it was the gluten free flour, the slightly warmer temperatures we’ve been having this past week, or some combination thereof, but I’m very happy with this. 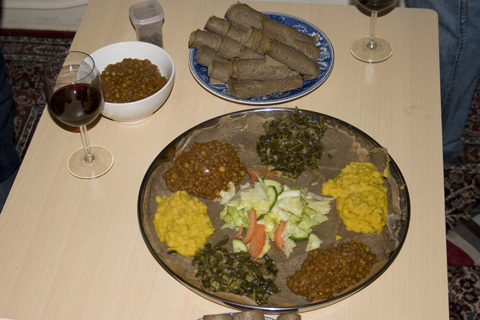 Also, I’ve read multiple places that once you have done some baking (although you don’t technically bake the injera) with yeast-gathering processes, it causes more yeast to be in the air, so that may have been it as well. 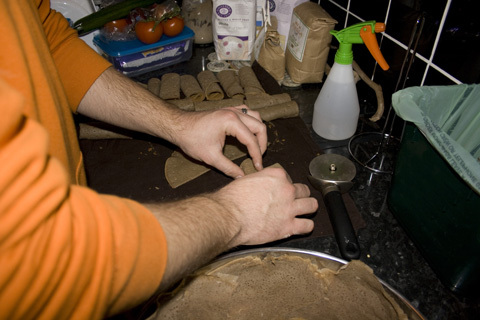 Remember, if you try this at home, be sure to not close the lid all the way, or else the starter might explode. I found this recipe originally here (source Oprah? ), but it was full of meat products, although the spices and everything else sounded amazing, so I remade this recipe with the following recipe instead, which, in its vegan goodness, is absolutely yummy.Â It’s already been a hit with Tiana the first time I made it and again it seemed to be very well-received when I made this for like 8 people a couple nights ago. In a soup pot, add the chopped onions, garlic and spices to the vegetable broth and bring to a boil. Reduce the heat, add the tomatoes and crush with your hands. Then add the soy products, salt and pepper to taste, and simmer for a couple minutes. Then add the potatoes, black-eyed peas and greens. Simmer for 30 minutes, covered. Stir every 5 minutes or so. Season with hot sauce and serve with cornbread and let the flavor pwn you. Serves like 8 or more. Great for leftovers, too.